The Gear 360 is spherical, just like its output. It has high-quality (for smartphone-sized sensors) 16MP cameras in front and back, that can fire either separately or simultaneously. If used together, the images can be stitched into a 360-degree rectilinear image that can be uploaded to services that support 360 -- including Google Photos, Facebook, and SmugMug, for example. There is a handy tripod socket on the bottom, which can also be used with the camera's own tiny tripod. Unless the camera is attached to something you do need to be careful where you set it, as it can actually roll (and potentially roll off a table). The bulging lenses also make it seem pretty fragile, and I suggest keeping it in the soft case Samsung provides when not in use. Otherwise there are just too many places where it can be scratched. The shape also means it doesn't fit easily in a shirt pocket, the way the Ricoh Theta S does. So you have to really want to bring it along -- while with the Ricoh I could just leave it in my pocket and not think about it until I wanted to use it. 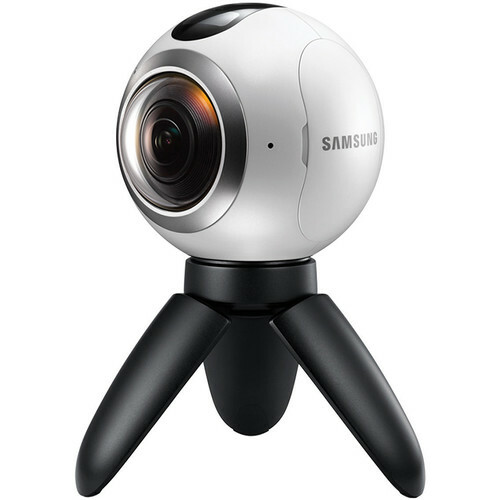 The Samsung Gear 360 does have some protection against water and dust (IP53 rated), but it isn’t really set up to be a go-anywhere action camera. Its microSD and USB slots have a weather-sealed cover. The camera comes with a cute little tripod (about 6-inches high), but for serious work you’ll want to use the 1/4-inch tripod socket to attach something larger. It does do a fairly good job of making its tripod “disappear” when you stitch its 360-degree images together – albeit by omitting detail at that portion of the image. The Gear 360 features two 15MP cameras, each with a 180-degree field of view. When used together, and stitched, the resulting still images are about 30 MP and video is output at 4K resolution (30 fps). The camera’s f/2 lenses make it reasonably-good in low light (for what is essentially two smartphone cameras). There is also an integrated HDR function, but it appears to be more of a tone-mapping feature than a true multi-shot capture like on the Ricoh. Image quality is quite good given the obvious compromises of a tiny sensor and plastic, wide-angle, lens. Remember that the 30MP is spread around an entire 360-degree field of view, so there isn’t all that much resolution in each area. Similarly, 4K video also gets pretty thin, but is much more usable than the 2K video from the Ricoh. Similarly, because there are only two cameras, details are scarce at the fringes of the image from each camera. So you’ll want to make sure one of the lenses is pointed wherever you think the most action will be. You can control the Gear 360 directly, using its small LCD and control buttons. It supports 180, 360, and time lapse photos and videos. There is also a self-timer option. The time lapse feature is pretty cool. It fires a shot every few seconds (user-settable) and combines them into a video. I was able to get a few hours of time lapse on a battery charge. You can also control all of the camera's features from Samsung's smartphone app, if you have a compatible phone. This is usually preferred, as it allows you to set the camera up, get out of the way, and then have it shoot. Otherwise it is hard to get yourself out of the picture when shooting 360. Realtime preview from the camera is only supported on Samsung Galaxy S6 and S7 family, and Note 5 smartphones. Similar to other cameras, the process of stitching images together to create the initial 360-degree image is camera-specific. Samsung bundles a copy of Action Director from Cyberlink (Windows only), that does a reasonably good job. Some users have found they can get better results by purchasing PTGUI. Once the images are stitched, then you can upload them to Google Photos, Facebook, or any other site that natively supports 360-degree photos and video. The only oddity I found was that some of my 360-degree photos appear upside-down when viewed online on Facebook. The camera was simply placed on an exhibit case in the middle of the room. Clearly a tripod would have improved things. It is easy to get confused by the distinction between simple "monocular" 360-degree video and photos -- like those captured by the Ricoh, the Gear 360, and Nikon's KeyMission 360 -- and true 3D images like those captured by higher-end devices like Google's Jump, or Nokia’s Ozo. At CES I'll be looking at some consumer-priced 3D 360-degree options, but they won't be shipping for a while. You can look at simple, mono, 360-degree footage in a VR headset, but both eyes will see the same thing, so there won't be any binocular depth. As you might expect, you can easily look at your Gear 360 content on your Gear VR if you have one. that I’ll lose the 360 capability. (Rotating them 180 before uploading also didn’t work). Must be a bug someplace. 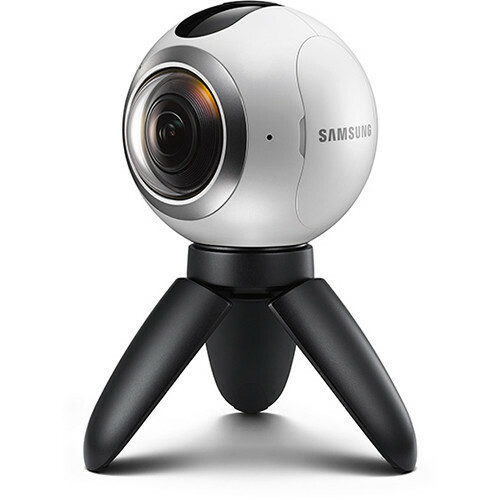 Samsung Gear 360 (now $299): The best image quality for the price, and a good control interface. The awkward form factor may be off-putting though. You also need to have one of the supported Samsung phones to take full advantage of it. Nikon KeyMission 360 ($496): The sample videos I've seen look gorgeous, and the camera is suitable for action camera applications, but I haven't had a chance to use one personally, so I don't know how well it works in the field. Customer reviews on the B&H site are pretty negative, though, so buyer beware.